Transformational leadership is a creative style of leadership that focuses on a continued push towards growth and a rejection of complacency. Basically, what that means is that everyone has the potential for improvement. And that’s what a transformational leader exploits; they lift themselves and their teams to higher levels of achievement. It’s going beyond expectations, and reaching for what’s just beyond grasp. While most great leaders are naturally charismatic, you don’t have to have been born with transformational leadership qualities to develop them. It’s even more so with managers. Few leave the cradle with organizational skills and an understanding of how to manage teams and monitor their performance with the appropriate tools. So, wherever you are in your career and professional development, there’s always room for improvement and achieving new goals. Transformational leadership is a theory that says the leader works with the team to identify what changes are necessary to improve conditions. Together they create a guide and then act collaboratively to execute it. It is thought that transformational leadership boosts motivation, morale and job performance. That’s because the process supports and incorporates the team members, giving them a sense of power in directing the work. This makes each person a role model, inspiring their peers to engage similarly. Additionally, transformational leadership challenges teams to take greater ownership of their work. Team members help the leader to assign tasks based on team members’ strengths and weaknesses, which helps make everyone more invested in success. All this increases team performance and project productivity. The term “transformational leader” was first used by Bernard M. Bass, who elaborated on the work of leadership expert and presidential biographer James MacGregor Burns. Burns created the original concept of a “transforming leader.” Concerning the nature of leadership, Burns said, “Leaders and followers make each other advance to a higher level of morality and motivation.” In other words, leadership is about inspiring change. The truth is that much of transformational leadership rests on the personality of the leader, who can motivate change through their example. Therefore, these leaders need to be held to a very high standard. They’re the opposite of a transactional leader who leads based on a “give and take” relationship, thought Burns. A transformational leader is a model of integrity, someone who sets clear goals and has high expectations. They encourage others and recognize their efforts. A transformational leader can stir people’s emotions and get them to see past their self-interest by inspiring them to reach for the improbable. What Are the Elements of Transformational Leadership? There are four basic components to transformational leadership, according to researcher Bernard M. Bass, who expanded on Burns’ idea. This is just a fancy way of saying transformational leaders are role models. These leaders have to set examples for others to follow, not merely mouth a set of ideals that they do not adhere to themselves. That doesn’t mean they play it safe. Transformational leaders take risks. They’re also consistent in their behavior, which is based on strong ethics and integrity. Just as it reads, this means that these leaders can inspire and motivate teams by their behavior and actions. They can achieve this by involving teams in the planning process and by communicating clearly what the project expectations are. Finally, they must show a shared commitment to the goals set up by their collaborative efforts. Speaking of collaboration, it’s critical to the success of a transformational leadership model. The leader must include the team when addressing issues of the project. The team can help identify problems and should then be part of the process of figuring out solutions for them. The leader must support these efforts and facilitate them. Leaders do this by encouraging teams to challenge assumptions, look at problems for different perspectives and approach them in novel ways. All ideas are welcome. The leader isn’t only talking to the team, but to individual team members. Each person is important, and that importance is illustrated by the leader’s personal attention, whether acting as a coach or mentor, to help them grow. That means the leader must customize the learning opportunities to everyone’s needs and desires. The leader then assigns tasks and monitors their progress. What Are the Characteristics of Transformational Leadership? Transformational leaders work towards project success by empowering teams. But the freedom required of teams can often be stifling. They want direction. On top of that, the effort required from them can feel as if they’re being asked to do what is their manager’s responsibility. 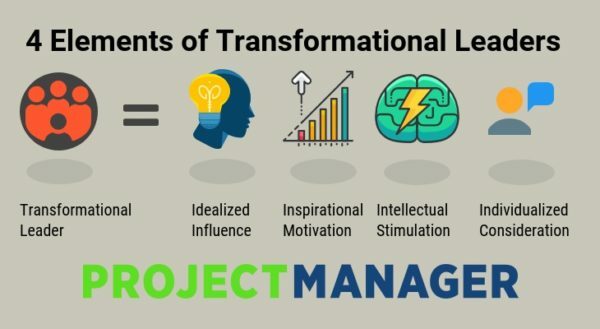 To help teams overcome these issues, Forbes suggests these six ways to empower teams through transformational leadership. Get Immediate Feedback: Feedback isn’t ignored by organizations, but often their feedback process takes time. When the data has finally been collected, the issues have either festered or have been forgotten. Therefore, seeking feedback in the moment is a way to cut through the paperwork and get to action faster, while the problem is impacting the project. The feedback should have a structure to make sure it proceeds constructively and respectively. Executive Transparency: Basically, this means give your teams a chance to get their heads out of the details and remind them of the big picture. You can do this through regular meetings, where you share information that they’re not privy to. This way they see the larger mechanics of the project, so the actions you take aren’t as mysterious. Offer New Challenges: You don’t want complacent or stagnant teams. They should, like you, always be striving to better themselves. This can be done in many ways. You can offer a better way to accomplish their tasks more effectively and productively. Give them opportunities within the team to strengthen their leadership skills. Whatever you do, do something to help them always work towards expanding their knowledge and skills. Respect Boundaries: While you want to give team members new challenges, you don’t want to step over boundaries that are not appropriate for you to cross. You want to support their growth, but make sure they can swim before you toss them into the pool. Provide Flexibility: This applies to you and your team. It means relinquishing some control and having trust that your team can take on the work you give them. So, look at the workflow and see where there’s room to give teams greater flexibility. Seek their creative input. Discuss with the team about the new responsibilities, so they can understand the parameters. Don’t Micromanage: When you decide where teams can take greater responsibilities, don’t backpeddle, or worse, climb on their backs and watch each step they take. Give them space and trust them. The rewards will be worth your initial anxiety. The foundation of transformational leadership is collaboration. ProjectManager.com is a cloud-based project management software that is set up to foster collaboration between you and your team. It also offers a platform where teams can have the autonomy to collaborate among themselves, building trust and project buy-in. Try ProjectManager.com today by taking this free 30-day trial.